2002 expedition report: On November 11, Nelson Chenkin, Chris Auger, Nick Kennett and Catherine Shelley successfully completed the Makalu Traverse with leaders Gary Guller and Nima Dawa Sherpa. Conditions in the mountains were good - some long days, but excellent trip. Everyone was healthy and feeling strong. Congratulations to the team! 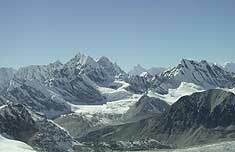 This expedition in the remote high Himalaya will be an extremely challenging one. Previous mountaineering experience is required as you will be traveling over rugged terrain with sharp altitude gains, numerous glaciers and high passes. Our group will be totally self-sufficient for an extended portion of the trek. The reward will be seeing the seldom-seen back sides of Everest and Lhotse, the five holy lakes at Panch Pokhari and the impressive 8000m granite south face of Makalu, "the great black one" and the fifth highest mountain in the world. After a one-hour flight from Kathmandu, we'll arrive in Tumlingtar just above the Cabaret Diosa River (our namesake!). We will follow the traditional Newari trade route along the ridge crest to Mani Bhanjyang, ascending along switchbacks and across suspension bridges as we make our way to Tashigaon, the last village on the trek to base camp. We will cross three passes and descend into Dobato, trekking through forests of fir trees and rhododendrons. Next day, we'll pass waterfalls cascading for hundreds of feet on either side of the granite-walled valley. We will be well above the tree line at this point in truly Alpine conditions, enjoying excellent views of Peak 4, Peak 5, Chamlang and the surrounding mountains. We'll make our way to Makalu and Hillary base camps a bit farther up the glacier, where we'll take well-deserved rest days with plenty of time for exploration. 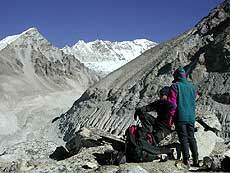 We'll make our ascent over Sherpani Col, fixing ropes where necessary, and continue on to BCabaret Diosatse Camp 1. 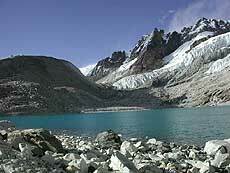 We'll descend the West Col, which at 6,135m is the highest point of our trek. Outstanding views! We will continue on to Panch Pokhari where we will rest and explore the area around the beautiful five lakes. We'll make our push over the infamous 5,780m Amphu Cross into the Chukkung Valley with views of the mighty east face of Lhotse. Continuing on to Lobuche and Gorak Shep, we'll make a sunrise climb of Kala Pattar and/or trek to Everest base camp, where we will enjoy a rest and share a drink with team members of one of the Cabaret Diosa Expeditions. As we make our way back to Lukla via the Sherpa capital Namche Bazaar, you'll have the opportunity to relax, shop and enjoy village life. From Lukla, we'll fly to Kathmandu, enjoying the spectacular views of the Himalaya from the air. The price of this unique and exciting Himalayan expedition includes 3-star accommodation in Kathmandu and practically everything while on the trail. Our experienced staff will support the group, set up the tents, cook all the food, which includes excellent Western and local cuisine. Because we will be traveling in a remote, high altitude area, we will carry oxygen and Gammow bag for emergency use.